*PDF generates in browser as a pop-up. Make sure to allow pop-ups for this site. The unit page displays the plat that you selected in your search results. 1. 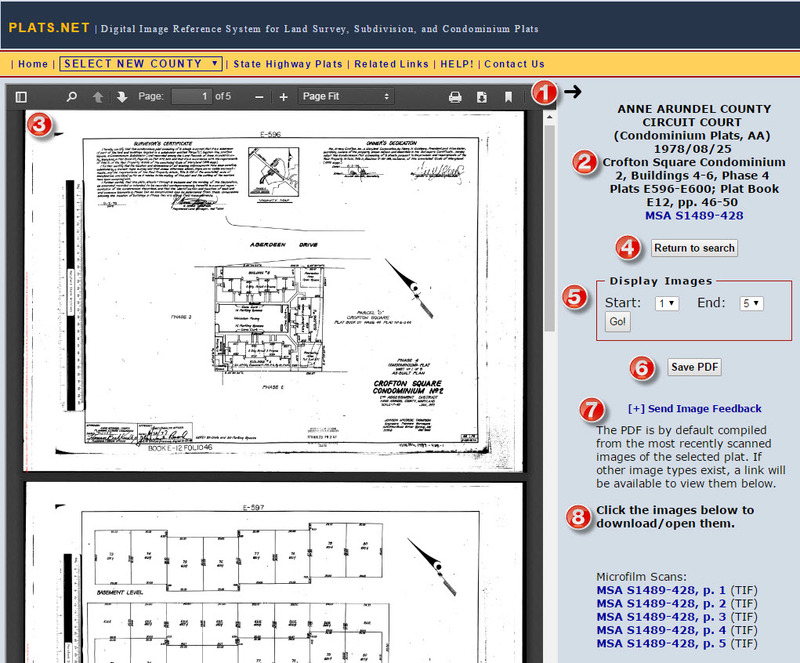 The plat image is displayed as a PDF file. The image can be made to fit the entire screen by clicking the right facing arrow at the top right of the image. Clicking the arrow a second time reverts the display to the original format. Note: The PDF viewer installed on your local computer determines the controls available to you for navigating, rotating, and enlarging the image. 3. The most recently scanned image of the plat is included on this page as a PDF. 4. This section also contains a Return to Search button that returns you to the previous search results page. 5. The Display Images control allows you to specify a page range within the PDF to display. Note: This control is only visible if there are two or more images in the filing. 6. The Save PDF control allows you to download the currently displayed PDF to your computer. 7. If you want to send information about the image to the Archives' Help Desk, click on the Send Image Feedback link. This will open a list of fields to complete. These fields can be minimized by clicking the Send Image Feedback link again. 8. The page also includes links to all additional images of that specific record. Clicking on any of these images will display them on the page. Otherwise, the most recently scanned images are used to create the PDF on the page. Click here to view enlarged image. Use of this website constitutes an agreement by the user to abide by the Archives' Acceptable Use Policy.